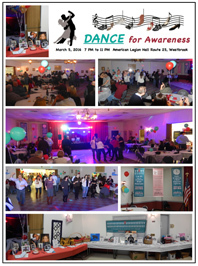 On March 5th, over 170 people put on their dancing shoes and joined us for the 4th annual “Dance for Awareness”. All enjoyed an evening of socializing and dancing to the music presented by DJ Cory Creamer. A fantastic Silent Auction and Gift Item Auction were well received with over $2,500 raised to benefit Brain Aneurysm Awareness. A special shout out to the winner of $368 in the 50/50 raffle and turned it back over to the event. We extend our heartfelt appreciation to all the wonderful sponsors and committee members that donated items to the auctions. We also thank the committee for their continued hard work in organizing these important events. This evening was especially meaningful, as it provided us the opportunity to honor the heavenly birthdays of our two girls – Kim Tudor’s 40th birthday on March 1st and Karolina Kurka’s 32nd birthday on March 5th. Both girls were taken from us too young, as a result of ruptured Brain Aneurysms. As always, our overall goal is to HELP SAVE LIVES through Brain Aneurysm Awareness, Education and Research. Thank you for making the “Dance for Awareness” another great success.